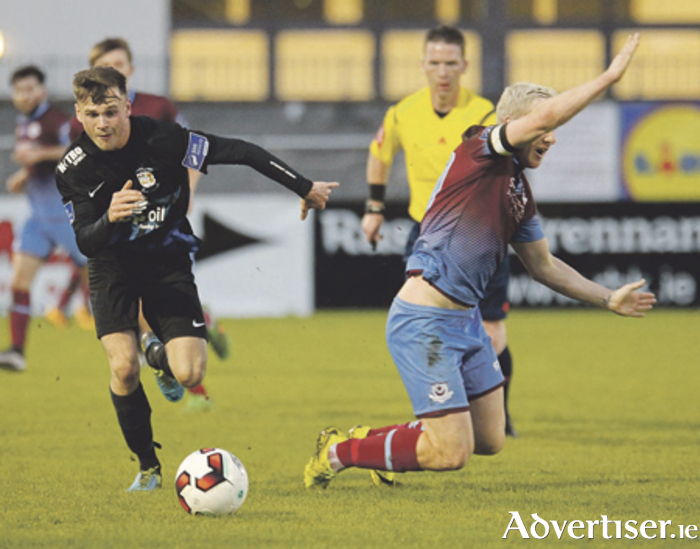 Despite producing a plucky performance against high-flying Drogheda United at Lissywollen last Friday night, Athlone Town came away with a disappointing one-nil defeat. Colin Fortune welcomed back Joe Moloney to his defensive line after his two-game suspension, while Aidan Byrne and Chris Reid retained their places after coming on as substitutes against Shelbourne, Jack Quinn and Sean McGrane starting this one on the bench. Dylan Owens retained his place in goal after Jamie Quinn was injured during the pre-match warm-up. This was a game of few chances as both sides battled for dominance. Just a few minutes after the start Drogheda had Athlone hearts racing when Marc Griffin flashed across Dylan Owens’ goal after The Town had given up possession softly in a dangerous area. Aidan Byrne spurned a good opportunity to put Athlone ahead just inside the 10-minute mark. A Claudio da Silva cross from the left was disappointingly fired over by the Athlone front man. Just a few minutes later Drogheda almost scored when a long ball forward was not dealt with by Athlone’s defence. Drogheda’s Jake Hyland raced clear and rounded Owens in the Athlone goal before seeing his goal-bound effort cleared by Joe Moloney for a corner. The first half ended with the sides scoreless. Chances continued to be limited after the break, but the deadline was broken by Drogheda just before the hour mark. The Athlone defence was dropping deep and failure to clear their lines allowed Griffin to steal in and drive the ball home low to Owens’ left from around the edge of the area. There was further drama to come as both Athlone and Drogheda received red cards. Cormac Rafter was given his marching orders for picking up two yellow cards, the second for a rash challenge on Sean Thornton in the centre of the park on 79 minutes. Drogheda’s Gareth McCaffrey also saw red after a heated altercation involving several players from both sides. When the dust had settled the referee showed McCaffrey red, but only after showing it to David Brookes in a case of mistaken identity. Athlone were unlucky not to find an equaliser in the closing stages of the game. A Claudio da Silva corner was floated dangerously into the Drogheda area, but Ryan Gaffey’s header grazed the wrong side of Stephen McGuinness’ goal before going out of play. A final opportunity fell to The Town’s Jack Quinn in injury time, but he too could not capitalise, heading the ball harmlessly wide. The win sees Drogheda on the verge of securing a play-off spot. Athlone remain second from bottom after Cabinteely lost their game. The Town face a daunting proposition tomorrow evening when they face-off against runaway league leaders, Limerick.